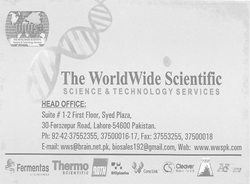 We provide quite affordable services to authors including Bioinformatics and Statistical analysis of their results. English Improvement Service (EIS) is also provided on demand. We hereby assure you that your data is completely safe with us. We would not send/dissipate/show/publish this data/research or any part of it anywhere or at any forum online or offline. We take full responsibility of your Intellectual Property Rights (IPRs). Please consider following pricing options for English Improvement Services depending upon your time and money budget. To get a quote for Bioinformatics and Statistical Analysis, please contact at services@als-journal.com with all of your data and required analysis. For Bioinformatics and Statistical Analysis please consult the following rates. All prices are in US dollars. You will be charged in your local currency at the exchange rate on the day your payment is made. Bill against sought service/s can be paid by both online and offline method. Once your order is received, you will receive an email having details of payment procedure.